I wish I could celebrate the first day of October like most—with scarves and boots and a mug of steamy cider! Instead, I’m debating between capri leggings or shorts; I’m hemming and hawing over long sleeves or short sleeves. This is fall in the South. To make up for the lack of brisk air lifting the scent of crisp leaves into the air, I’m diving right into seasonal cooking—and this Apple Cheddar Flatbread Pizza With Caramelized Onions is how I’m kicking things off. Crisp apples. Crunchy walnuts. Caramelized onions. Rich cheddar. And a drizzle of tangy balsamic. These toppers sound fit for an autumnal salad, but I threw them down on some crust for a fall-inspired flatbread instead. Does it seem a little offbeat to you? Typically, when I’m hit with a pizza craving, I need a classic pizza slathered with tangy marinara; a big pie smothered with stretchy cheese and buttons of salty pepperoni. But I do make exceptions. This past summer, while at a local brewery and restaurant, I dipped my toes into the world of honey-drizzled pizza. Honey! It was eye-opening and amazing. That delicious experience was the push I needed to bring this far-out sweet and savory flatbread to the blog—something I’ve been enjoying behind the scenes myself for the past two years. Apple Cheddar Flatbread Pizza With Caramelized Onions. Cheddar and apples have been known to get along quite well, and it’s not uncommon to invite some sort of caramelized onion compote to a cheese board, so this recipes makes sense to me. While the walnuts add a fabulous crunch, the balsamic drizzle brings on a tangy hint of sweetness. Something that’s just balanced enough to bring out the best of each component on this pizza. You could eat this pizza without the balsamic, but I highly recommend getting a nice and thick balsamic to drizzle on top. It adds *so* much. Just note that caramelized onions are a critical component, and doing it properly is also important (and easy). A lot of people, and even recipes I run into online, rush the caramelization process thus resulting in non-caramelized onions. Caramelization is a slow process that melts the onions into sweet, golden threads. The caramelization process lasts at least 30-40 minutes, so don’t confuse it with quickly “browning” onions at high heat, or you’ll end up with a completely different flavor. Take the time—it’s totally worth it. Celebrate fall and apple season with this Apple Cheddar Flatbread Pizza With Caramelized Onions; it's the perfect weekend treat! 1 apple; thinly sliced, preferably with a mandolin I used gala apples. Any sweet and flavorful apples will work AKA not a "delicious" apple. Melt the butter in a medium saucepan over medium-low heat. Add the sliced onions, sprinkle with salt, and toss them to coat. Let them simmer for about 30-40 minutes, stirring occasionally to prevent burning. Low and slow is the method you want to use here. Once the onions have browned and become extremely soft (this will take about 30-40 minutes) you can remove them from the heat. Pre-heat the oven to the suggested time on the pizza shell packaging or, for homemade, see notes. Place the pizza in the oven. If store-bought, cook as per the package's directions. If homemade, cooks as per the recipe's directions. You're looking for a golden crust and melted cheese. Remove the pizza from the oven and let it cool for 5 minutes. Once slightly cooled, drizzle balsamic over it, sliced and serve. OMG. I need this flatbread pizza in my life! I too love sweet-savory pizzas with a drizzle of something special like honey or balsamic. The balance of flavors in this flatbread sound absolutely perfect with the caramelized onions, apples, and cheddar. This is fall at its best (even if the temperature outside doesn't want to cooperate)! Gorgeous photos, too. Oh!! This flatbread stole my heart the minute I saw it. Then when I found out all of the ingredients it had -- my mouth starting watering. Caramelizing onions take the onions to the stratosphere. And honey? Save me a slice please. Better yet, I'll make me one. This looks like a winning combo! So many different flavors and textures, it sounds delish. I like the side note about not rushing the onions....that has happened to me many times and its totally worth taking the extra time to do them right. We are definitely having fall like weather here and I'm all over this one! Oooh honey drizzled pizza sounds divine. So does a winter that feels like fall! 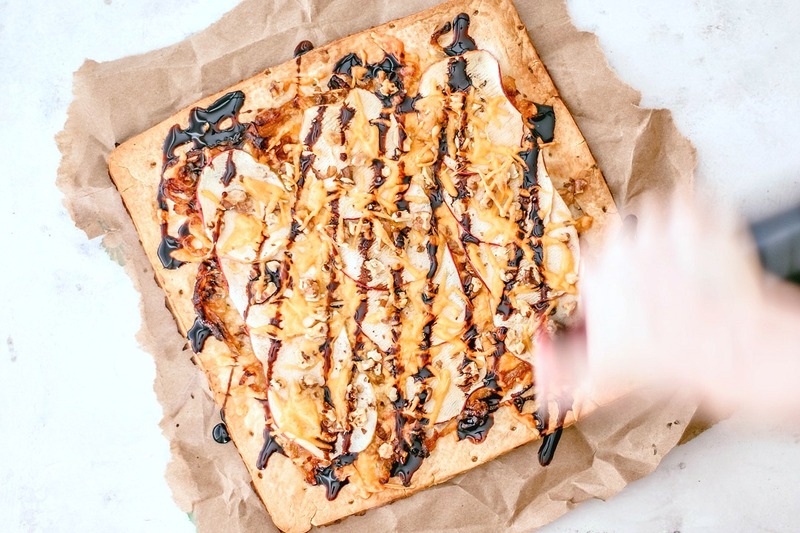 Do you think a little drizzle on honey with the balsamic for this pizza would be good? Those caramelized onions are calling my name! The flavour combination here sounds fantastic and I sure I can eat the whole pizza by myself! I haven't made pizza in a while so I can't wait to try this recipe out. What a great combination of flavors for a pizza! Perfect for a light dinner or party appetizer! Oh I am loving this flatbread pizza! The apples and cheddar get it off to the right start, but those caramelized onions...over the top! The balsamic drizzle seals the deal for me. Just pinned this gorgeous number and can't wait to try it out! This is amazing, I love this combination of ingredients! I am with you on wanting Fall to be here, and celebrating it despite the cool weather staying away :( I roughed it out with jeans and a shirt today when really it was shorts and t-shirt weather! Thanks so much, Donna! Haha, you sound *just* like me, Donna. I dressed for fall last night when we went to dinner and it was 80 degrees. I'm just gonna pretend… :| I'll get a taste this weekend as I'm headed out to Portland, ME. Very much looking forward to feeling some sort of cool breeze on my face! Oh my....what a delicious looking pizza. Such a fun twist on traditional pizza. Love ALL the flavours happening here. I think I just might have to give this recipe a try for our anniversary weekend. Now....what wine shall I choose from the cellar?? I love apple with caramelized onions. And cheese! This looks amazing! The onions can take a while, but definitely makes a huge difference when they are done right! Loves me some pizza and especially caramelized onions. They are always worth the effort. I could devour these whole pie (well most of it) Friday night for dinner with a glass of vino or beer. YUM! It's still hot here too! We do get winter, but fall usually arrives late October for us. I'm mentally pretending it's fall anyway, and this pizza looks FABULOUS! I love honey on pizza!